Our High Quality Catering Supplies are ...On Sale! 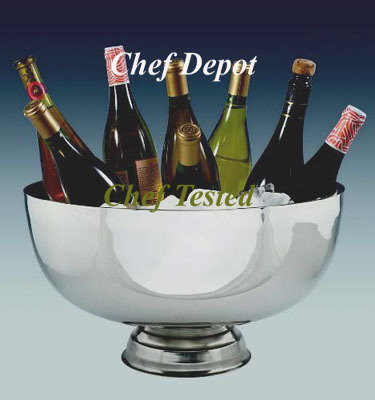 We supply these items to Fine Quality Caterers, Restaurants, Clubs and Hotels! The quality and value is right here. Call us with any questions! 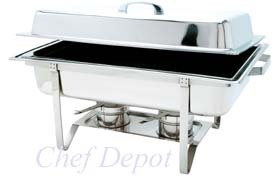 These 8 quart full size folding stainless steel chafer features heavy cast legs. This heavy duty favorite comes complete with a 2-1/2 in. 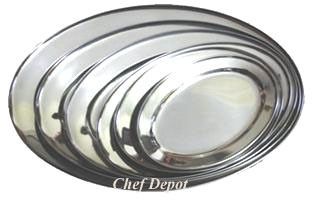 deep food pan, satin finish dome cover, dripless water pan, frame, and two fuel holders. Chefs Note: Saves Space! This is the standard chafer used by goverment operations and catering companies. Display ice sculptures and chilled foods with style and elegance. Our new LED lighting system alls easy color changing. Highlight all your cold food service and ice sculptures with shimmering brilliance. Impact resistant, FDA approved plastic will not rust. Complete with attached drain and a five foot hose. Trapped air insulation protects ice from rapid melting and prevents condensation on tray sides. Durable, long lasting for years of trouble free service. Only your imagination is the limit when it comes to how and when to use the ice sculptures. Add that special touch, to any occasion with classic gracefulness. Parties, weddings, receptions, anniversaries, holidays, buffets, graduation. Low Profile Lighted Ice Displays are designed to display and illuminate large ice sculptures and iced food displays. Designed to be the thinest, lightest and strongest in the industry. Base measures only 3 inches in height and is capable of supporting and lighting up to a 500 lb. ice carving. All displays include fluorescent tube lighting, acrylic ice tray with drain tube and crimp valve for easy ice melt disposal. Available in black and white. Order with or without LED colored light option. Aprox. Size: 56x24x9 in. Customers will pay for ice sculptures. 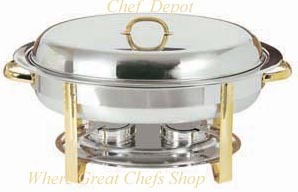 This 8 quart roll top stainless steel chafer features heavy duty brass legs & accents. This heavy duty favorite comes complete with deep food pan and dripless water pan, frame, & fuel holder. Measures aprox. 18 in. x 18 in. x 16 in. price goes down with quantity purchase. Chefs Note: We love these. 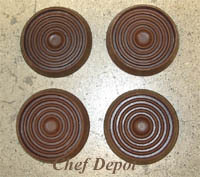 This is a very sweet and sublime design, many hotels & caterers use this item! 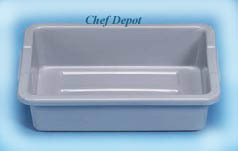 Chefs Note: We love them design, used by many large operations! 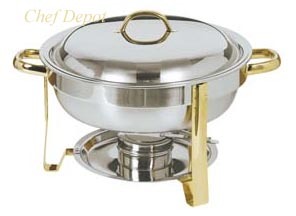 This 4 quart round stainless steel chafer features pure 24 kt. gold legs, handles and accents. This heavy duty favorite comes complete with a food pan and a dripless water pan, frame, and fuel holder. measures aprox. 16 15/16 in. x 14 3/16 in. x 11 7/16 in. price goes down with quantity purchase. 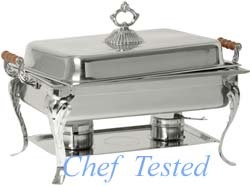 This 8 quart rectangle stainless steel chafer features real 24 kt. gold legs, handles and accents. This heavy duty favorite comes complete with food pan and dripless water pan, frame, and fuel holder. measures aprox. 25 9/16 in. x 14 3/16 in. x 13 in. price goes down with quantity purchase. Our Reusable Chafing Dish Fuel is the best. 6 hour clean burning, wick style fuel is perfect for catering events with chafing dishes. Resealable 9.2 oz. each. Made in USA. SAVES FUEL! Minimum order is 6 pieces. Ships to Cont. USA only. This solid stainless steel serving utensil set is the same set used at popular high end restaurants and upscale hotels. 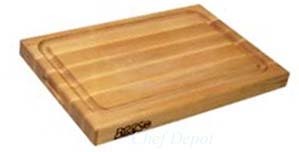 Made from durable 18/10 foodservice strength stainless steel it is designed to last! Average size of each piece is 12 in. long with a highly polished finish. The complete set has 11 pieces, as pictured. Individual pieces are also available ($8.00 ea. ), minimum purchase is 6 pieces, please call us. This is our Food Warming Lamp. Made of brushed heavy duty aluminum, features 5 adjustable height levels (helps with easy & compact storage), a 6 ft. power cord. Measures 22 in. W x 14 in. D x 21 in. Height, On/Off switch, 2 40 watt shatter resistant bulbs included, 8 lbs. 1 year warranty! 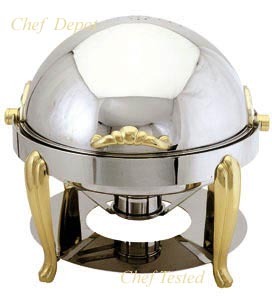 This Soup Warmer is the same one used at popular high end restaurants & hotels for soup service on buffets and catering events. Made from durable 18/10 foodservice strength stainless steel and highly insulated it is designed to last! 10 1/2 qt. Wet heat soup warmer with double handled lid and ladle. Temperature knob for simple temp. adjustment. UL listed. Specifications: Capacity: 10.5 qt., Height: 15 in. 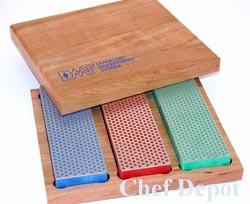 Chef Notes: Great gift for the serious gourmet and Chef. These slicers are a great choice for tossing together salad garnishes and fast coleslaw! 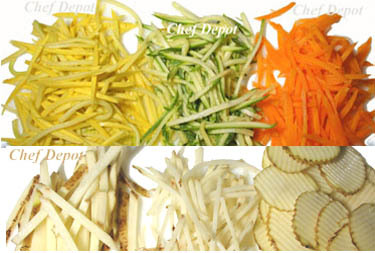 Our new set is great for sushi, carrots, radishes, birds nests, fast slices, ginger, garlic and zucchini squash baskets. We use the cutting safety glove, see below. 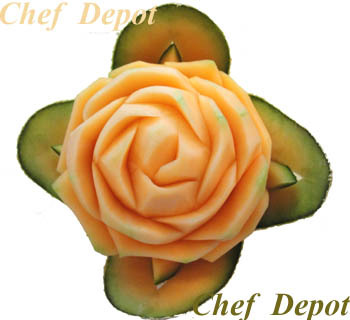 More Garnishing Tools are located here: More Ceramic Knives We test all our products you will love this product! The Stainless Steel Super Bowl is perfect for serving chips and snacks or chilling iced down down beer bottles, champagne and wine! Welded pedestal base. 13 Quarts high quality stainless steel. We know many catering event companies that serve iced beverages in these. Your guests will love the chilled spirits! Made of heavy Stainless Steel, very durability, superior heat conductivity, this commercial weight pan was designed for holding hot or cold foods. These measure 13 in. wide x 21 in. long. 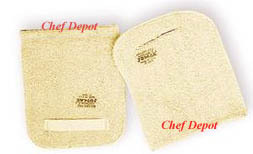 Often used for prepared foods (hot or cold) and holding foods in steam tables. It also makes a great drip pan for automotive and manufacturing uses. Perfect for restaurants and bakeries! Minimum order of 2 pans. Choose from standard gauge or heavy duty 22 gauge below! Do you own a heavy duty cooling rack that will cool anything? Ours will not bend, it's made to last through a lifetime of baking! We have cooled a lot of cakes, cookies and pies on these beauties! It's also made to fit inside our full hotel pans (click the link). It is perfect for roasting meats and we like it for smoking salmon and tuna on the grill! Take a side of salmon, or other fish fillets andd drizzle with fresh lemon juice and our Cajun Seasonings and smoke with hardwood chips on your BBQ grill at 200-250 degrees until fish reaches 160 F. ~ enjoy! The Stainless Steel Chiller Bowl is perfect for chilling iced down champagne, wine and beer! 18-8 Stainless Steel. Bright outside, brushed inside high quality stainless steel. The insulated double wall maintains coolness for a long period of time. 17 in. (outside dia.) 9 in. high. Welded pedestal base. Aprox. 23 Quarts. Your guests will love the chilled spirits! The knife is craft from the high quality German alloy steel in Solingen Germany. Lifetime Warranty. Chef Notes: A beautiful Santoku knife for the price, the stamped blade in nice and thin. 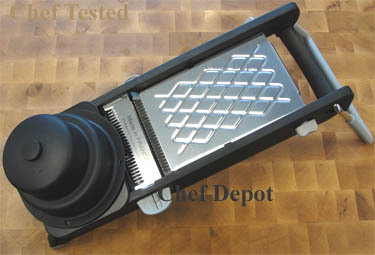 This is a great knife for fruit and vegetables, chicken and meats! the small blade combined with the medium sized handle make a very comfortable knife. Our Chefs have used every German knife made - we conclude these are the best you can buy. 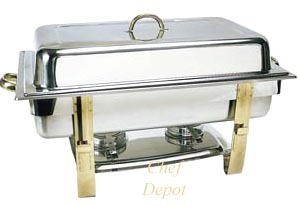 This 8 quart full size stainless steel chafer features heavy elegant styled welded legs and brass handles. This chafer is the choice of most upscale hotels. It comes complete with 2-1/2 in. food pan, dripless water pan, heavy duty frame, and two fuel holders. Click Here for Extra Hotel Pans! 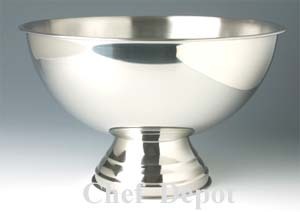 This 8 quart full size stainless steel chafer features nicely curved stainless steel legs. This version of the longtime favorite comes complete with a 2-1/2 in. 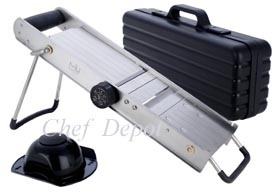 deep food pan, durable plastic handle on the cover, dripless water pan, frame, and two fuel holders. This is the standard chafer used by many catering companies. This 8 quart full size stainless steel chafer features heavy cast legs. This heavy duty welded SS version of the longtime favorite comes complete with a 2-1/2 in. 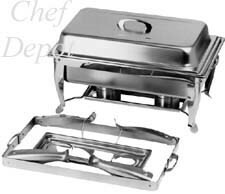 deep food pan, satin finish dome cover, dripless water pan, frame, and two fuel holders. This is the standard chafer used by many catering companies. 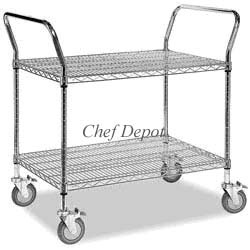 Ideal for kitchen and moving food and supplies at catering parties. This cart provides easy maneuvering and handles large loads (up to 1200 lbs.). Recommended for labs, food service, offices and hospitals. Easy to clean; won't collect dirt. Adjustable shelf height. Quiet 5" locking swivel casters! Ideal for Catering, Janitors or Workshop. A great cart at a great price. Choose from several sizes below. 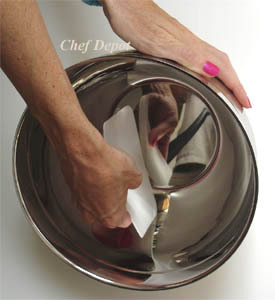 Our flexing plastic mixing bowl scraper is perfect for getting it all out! Used by Bakers and Chefs, this tool is perfect for working with dough and scraping off your work table too. Measures 5 1/2 in. x 3 1/2 in. with a beveled edge on 1 side. High quality crumb scrapers, made from anodized aluminum with pocket clip. Don't let your waiters on the dining room floor without them. I know a few waiters who are good at scraping every breadcrumb off the table with these, however the busboys usually do a better job. Chefs Note: We always make our waitstaff carry Wine Keys to quickly and easily open the bottles and to upsell the wine selection! Make your guests smile. Sold by the dozen only. Our new food storage containers are easy to use. NSF certified with measured colored markings. Minimum order is 6 pieces. Seamless construction, rounded corners and smooth walls for easy cleaning. Keeps your food fresh! Industrial grade construction ensures durability, features a smooth surfaces to maintain cleanliness. Marked with US and Metric graduations. These containers are used in Hyatt and Marriott hotels and most large restaurant chains. High quality, certified to NSF! Lids are sold separately. Chefs Note: These are ideal storage containers for all food ingredients. Keep your greens the freshest! We have other styles too! I use these for flour, bread crumbs, sauces, soup and chili! Perfect for home, banquet halls, restaurants and hotels! Choose from several sizes below. Our new food storage containers with heavy duty lids. Seamless construction, rounded corners and smooth walls for easy cleaning. Keeps your food fresh! Industrial grade construction ensures durability, features a smooth surfaces to maintain cleanliness. For use in Tep. 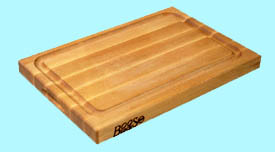 range of - 40 f. to 212 F., can be used to hold, transport or display foods and use these in steam tables. Marked with US and Metric graduations. 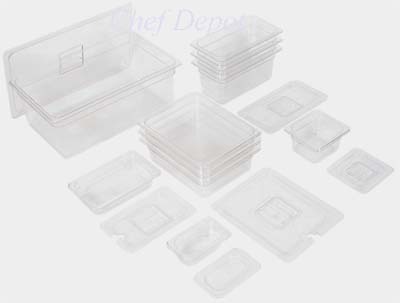 These containers are used in Hyatt and Marriott hotels and most large restaurant chains. High quality, certified to NSF!